Most stocks finished in the red Thursday, but the one that everyone had their eye on closed firmly in green. 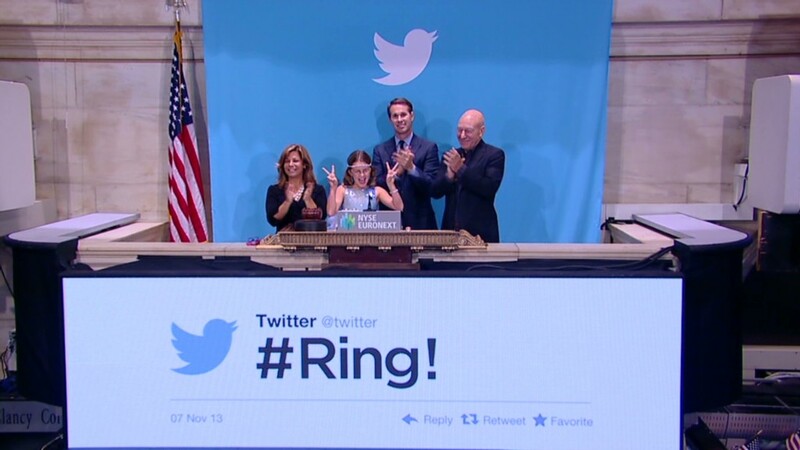 Shares of Twitter (TWTR) surged in their debut on the New York Stock Exchange. But it was a pretty rough day for stocks not named Twitter. 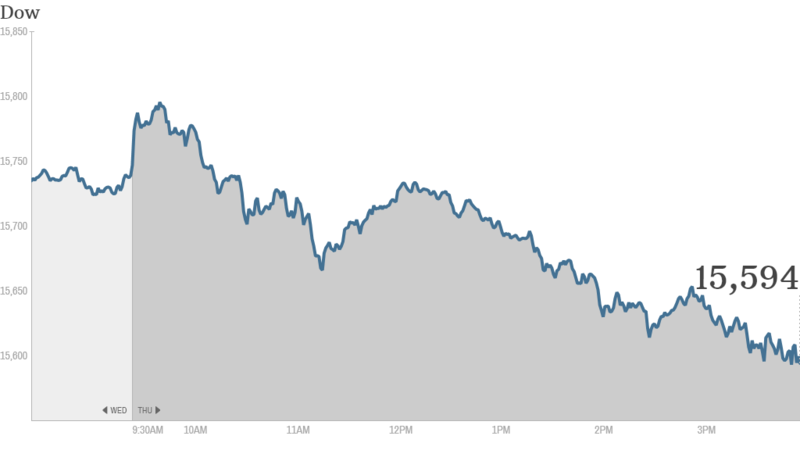 The Dow Jones industrial average fell more than 150 points, or 1%, while the S&P 500 dropped 1.3%. The Nasdaq was the biggest laggard of the day, down nearly 2%. Stocks have been trading near all-time highs recently. In fact, the Dow hit a new record early Thursday morning before pulling back. So Thursday's slump might be a sign that investors are growing more worried about how hot the market has been this year. Some analysts feel stocks are getting close to being overvalued. Twitter defies the bears. But Twitter didn't suffer from any concerns about valuation. The stock began trading at $45.10, 73% above its initial public offering price of $26, shortly before 11 a.m. ET. Twitter continued to rise, climbing as high as $50.09. It closed the day up 73% at $44.90, with more 117 million shares exchanging hands on the first day of trading. Still, rival social media sites Facebook (FB) and LinkedIn (LNKD) tumbled along with the rest of tech. The Social Media ETF (SOCL), which is expected to purchase shares of Twitter for its fund, declined almost 4%. Two mutual funds that invest in private companies and have owned Twitter shares for some time also decreased sharply. GSV Capital (GSVC) fell 13%, while shares of Firsthand Technology Value Fund (SVVC) declined 6%. Despite Twitter's strong debut, most traders on StockTwits were bearish on the company's future. "$TWTR Social media hype will not last long," said MasterBull. "Maybe another 6 years at most before the next big thing ... sound familiar 'my space' Bearish." Many traders said they expect Twitter will retreat once the hype dies down. "In the coming days $FB will turn Green & $TWTR will be beet Red. Bullish," said tman2k. But some traders did come to Twitter's defense. "Simple trade Psyche..Everyone thinks $TWTR is way over-priced here...but that is the reason it will even head higher," said leopardtrader. Earnings continue to roll in: The broader market was dragged down by companies with lackluster earnings. Whole Foods (WFM)was one of the biggest losers in the S&P 500 and Nasdaq as shares sank more than 11%. The sharp drop came after organic grocer cut its earnings and sales forecasts. "$WFM all these hipster not buying over price supermarket," said StockTwits user bullvsbear. "That's probably because they're shopping at their local farmer's market instead." Qualcomm (QCOM) was also weighing on the Nasdaq and S&P 500, as shares fell 4% after the company posted quarterly earnings that fell short of expectations. Groupon (GRPN) and Priceline.com (PCLN) both sank in after hours trading following their earnings releases. The two stocks finished the regular day of trading lower as well. Tesla (TSLA) shares tumbled again following reports of yet another fire in one of its Model S electric cars. "$TSLA buy one and than once it catches fire you get another one for free," quipped Hameed on StockTwits. J.C. Penney (JCP), however, jumped after the troubled retailer announced an increase in same-store sales for October. Upbeat economic data: Investors were initially encouraged by a report that showed the U.S. economy perked up slightly this summer, driven largely by businesses re-stocking their shelves, a rise in consumer spending, and the ongoing housing recovery. Gross domestic product -- the broadest measure of economic activity -- rose at a 2.8% annual rate in the third quarter, according to the Bureau of Economic Analysis. That marked the fastest growth in a year and was stronger than economists had anticipated. A separate report showed initial jobless claims declined for the fourth straight week. But the positive economic data also reignited speculation that the Federal Reserve may begin tapering its bond buying program, said analysts at Wells Fargo Advisors. The Fed's stimulus measures have been a major driver of the bull market over the past several years. Investors will continue to keep close tabs on economic data, particularly readings on the job market. The October jobs report is due early Friday. Economists surveyed by CNNMoney expect 120,000 jobs were added last month. ECB unexpectedly cuts rates: In Europe, it's all about the European Central Bank. The ECB said it cut a key interest rate to 0.25%, a sign of how fragile the European economic recovery is. European stock markets made modest gains in afternoon trading, keeping them near five-year highs.